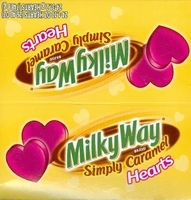 New Milky Way simply caramel hearts. A milk chocolate shaped heart filled with gooey creamy caramel. These are a perfect way to say I love you. It is hard to resist these chocolate hearts. You get a crisp chocolate shell over flowing with caramel. If you like caramel candy bars then I highly recommend this Milky Way simply caramel hearts. You get 24 1 oz hearts per box.